Wazir Khans Mosque, Lahore is part of the Tentative list of Pakistan in order to qualify for inclusion in the World Heritage List. 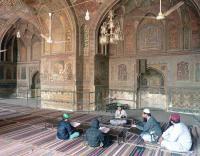 Masjid Wazir Khan is the 2nd Lahori Mosque on Pakistan’s T List. It was constructed in the 1630s during the reign of Shah Jahan around 40 years before the Badshahi. Thus both are examples of “Mughal” architecture - but in almost every other aspect they are significantly different. Whilst the vast Badshahi sits in isolated splendour opposite the Fort, exuding calmness with its subdued pastel colours, the Wazir Khan mosque is crowded inside the old city and reached from the Delhi Gate through a series of narrow hawker-filled streets. And when you get there it presents a riot of brightly coloured glazed tiles/frescos inside and out. The courtyard is reached via an arcade of shops built into the structure and inside is a space cluttered with tombs and bathing areas – so different from the giant empty space which greets one on entering the Badshahi. I have seen no formal statement that World Heritage status is an ultimate objective of all this but the attempt by Delhi to become a “World Heritage City” would seem likely to stimulate Pakistan to do the same with Lahore – nothing unites Pakistanis as much as a determination to match/surpass India wherever possible (though their “dislike” of the USA might run it close)! The restoration plan extends to at least 20 years so, if I am correct and the Masjid Wazir Khan would only be nominated as part of a possible nomination of the Walled City, then any action is likely to be many years away. I would also presume that any such nomination would encompass Lahore Fort together with the Badshahi Mosque if that had not previously been added to the Fort inscription.